I am overwhelmed by the response i received for the first five parts of “Similes & Metaphors of Pathology”. Thanks for the suggestions and giving me new clues/ similes. This has been an amazing learning experience for me too. I have decided to continue learning! I am planning to continue this series and will try to keep you engaged. More interesting ones to come in Part 7!…. Rodent Ulcer- Basal cell Carcinoma ( source) Basal cell carcinoma- Rodent ulcer. 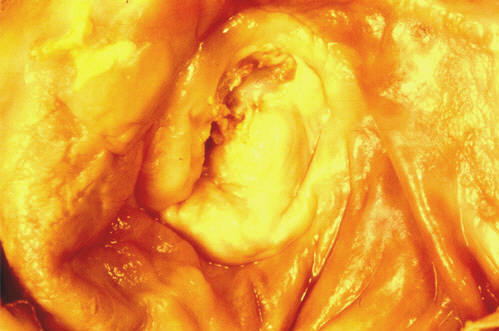 ulcer has an indurated edge and ulcerated centre. This is commonly known as rodent ulcer. Because of its “Gnawed” appearance i.e.to bite or chew/make a hole by chewing! Bread Butter appearance- Fibrinous pericarditis ( source ) Fibrinous pericarditis- bread and butter pericarditis. In acute stage of Rheumatic heart disease, there will be tenacious deposits of fibrin in the pericardium which resembles that of irregular surface of the buttered bread/ Bread butter appearance. Crohns disease- cobble stone appearance. (S0urce) Crohns disease- cobble stone appearance. Islands of intact, edematous mucosa which is surrounded by ulcers(Communicating fissures and crevices in the mucosa)s how the classic “cobble stone appearance. Fibroadenoma: Antler horn configuration of ductal epithelial cells. This is the finding seen in smears prepared from fine needle aspiration of fibroadnoma. The aspirates will be hypercellular with monolayerd sheets of ductal epithelial cells. These sheets are described as staghorn or antler horn configuration on the edges of these cellular sheets. Hailey Hailey disease: Diladipated Brick appearance. Source Hailey Hailey disease: Diladipated Brick appearance. This disease is an autosomal dominant disorder with recurrent eruption of vesicles and bullae. 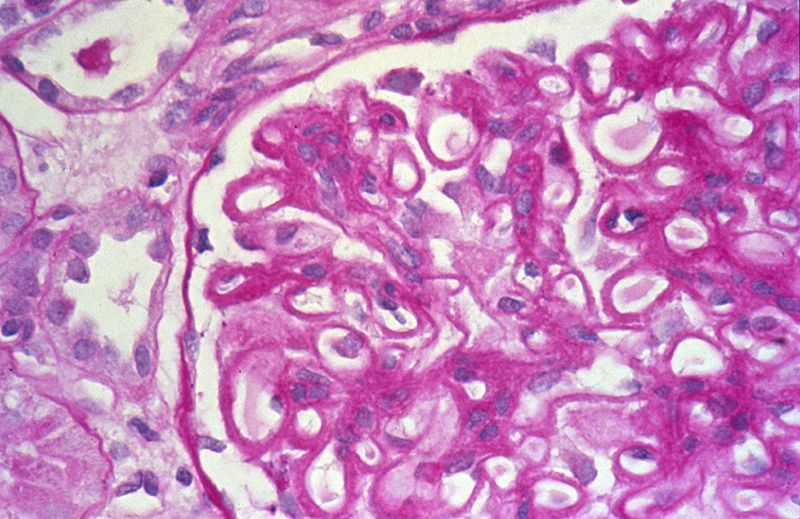 It is a light microscopic finding in renal biopsy in Lupus nephritis where the capillary walls are thickened due to subendothelial immune complex deposits. capillaries stains deep red and appears as homogenous and “rigid” thickening of peripheral capillary loops. This change is called the “wire loop” lesion. The candida are long filamentous organisms. The squamous epithelial cells, peculiarly aggregate around these filamentaous organisms, appears as if these cells are speared by these pesudohyphae, giving Shish- kebab appearance. Rheumatic heart disease: Fish mouth appearance ( Source) Rheumatic heart disease: Fish mouth appearance of Mitral valve. Most of the patients with rheumatic valvular heart disease have an affected mitral valve. There will be severe mitral stenosis due to marked thickening and fibrosis.This results in narrowing of its orifice to a slit, which resembles Fish mouth. The characteristic features of the nuclei of Reed Sternberg cells in Hodgkin disease. These cells have symmetric mirror image bilobed nucleus which resembles that of owl’s eye. The intranuclear inclusions in Cytomegalovirus-infected cells also looks like owl’s eye. How did you like this part of ” Similes & Metaphors in Pathology”? Have you come across any interesting similes/metaphors in teaching Pathology?